Once again this post is a little shorter as we work on the May subscribers report. 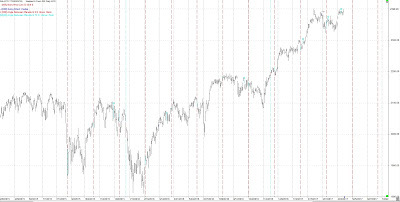 For the SP500, cycle-wise I’m looking at March 27th as the Primary cycle trough and April 13th as a double bottom. This puts us entering the 6th week of a new Primary cycle. We should therefore be looking for a pull back into the first 6 week cycle trough. The other possibility would be a ½ Primary cycle (9 week). We had a descending triangle (green) on the chart. As often happens price crashed through the upper line of the triangle, in effect gapping twice. Those gap areas may act as support. 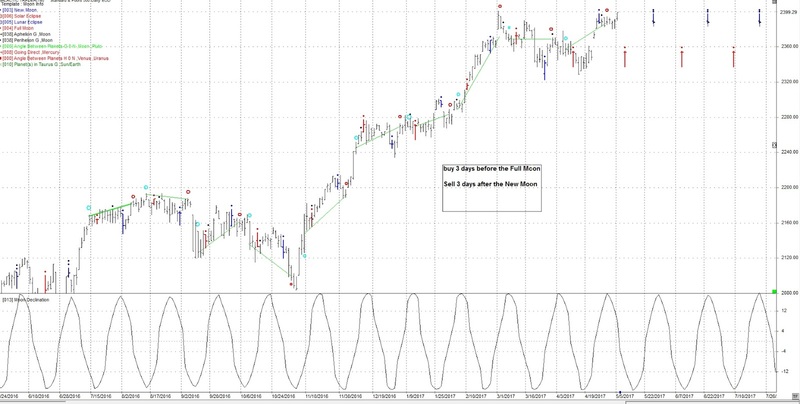 It should be noted Primary cycles (18 weeks) most often start with a nominal 6 week sub-cycle. The 2nd most common start is a 1/2 Primary or 9 week sub-cycles. The nominal range for the Primary cycle is 13 to 21 weeks. The recent high was on March 1st closing at 2,396 in the SP500. The high om May 5 was 2,399, a new All Time High. The last 2 months have been unusual and very difficult to forecast. 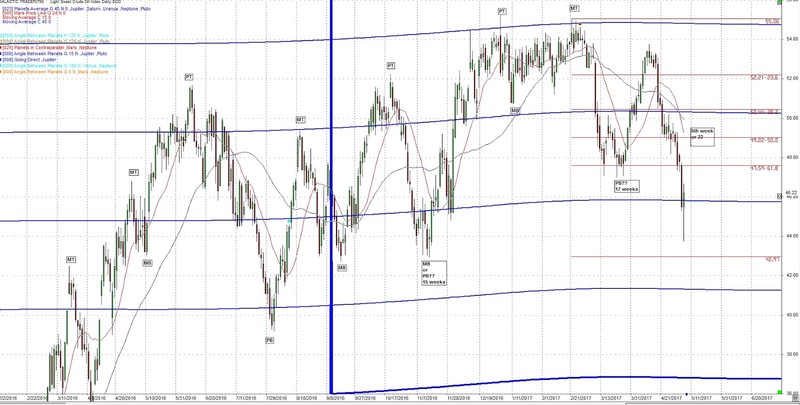 To summarize, I’m looking for a pullback in the short term to a 6 week or ½ Primary cycle trough. I’m expecting volatility with both ups and downs but moving forward I’m looking for a low mid-year (June / July) but probably June after reviewing the Astrological aspects. Note the 15 (red) and 45 day (blue) sma’s. 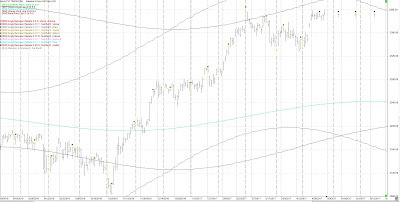 Price dropped below the 15 and 45 day sma’s and has now risen above those averages. This coming week has fewer significant Astros than what we have seen in March and April. Nevertheless, there are some new ones and the longer-term aspects we have mentioned still apply. 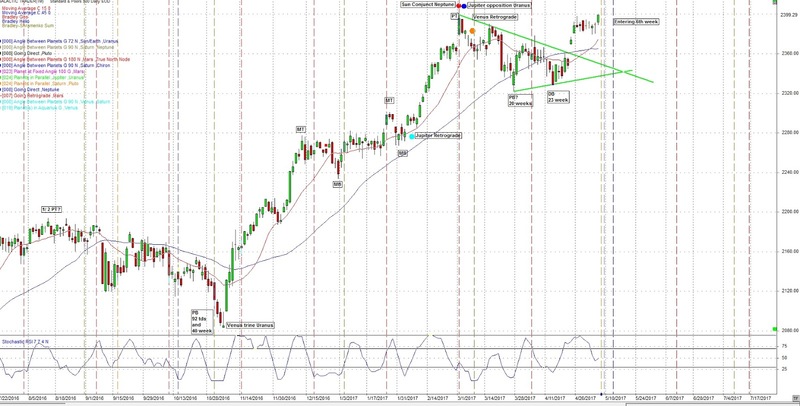 So far the Cycle charts have not resulted in unusual movement. This is not 100%. I’ve found it works best in a non-trending, sideways market. 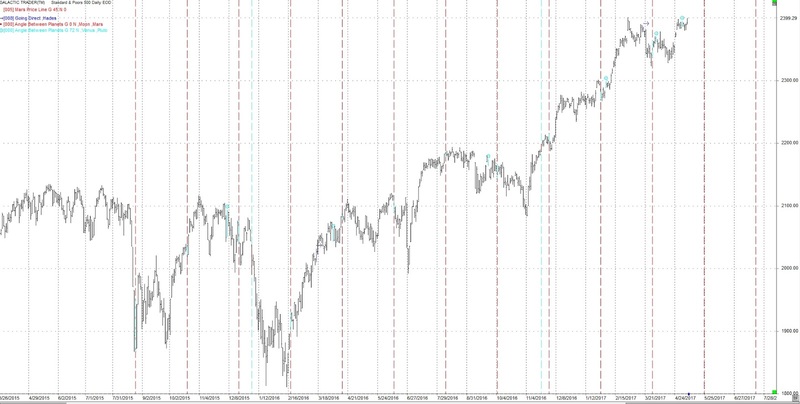 Another cycle that has been at highs and lows is the 40 trading day cycle *td). Next due May 24th +- 3 tds. This is the trine which occurs approx. 19 days (cd) after Pluto turns retrograde. The market often moves up around the exact date then pulls back. Watch for events that could lead to open hostilities or a strong geophysical event. This aspect together with a Full Moon may result in a sudden unusual event. Often at a crest but in the longer term not that significant. Often powerful. Look for a reversal of the current status. If still going up then start a move down and vice versa. Look at an orb of +- 5 td’s. There may also have an effect on crude as we have just had Mars aspect both Jupiter and Neptune within one day. Mars is active by transit. Expect hostilities to increase. Later in the month we have Venus and Mercury returning to their shadow dates and the 45 year aspect of Saturn trine Uranus. This is in orb most of the month. 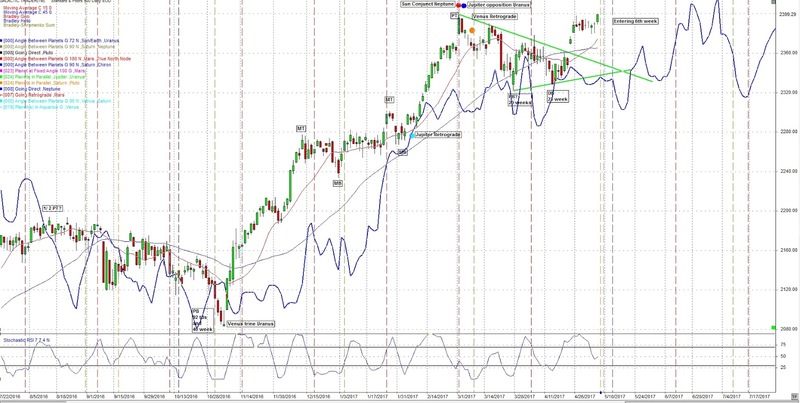 The following chart of the SP500 includes the heliocentric Bradley indicator (blue line). 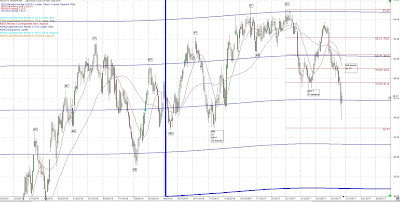 There are three possible change in trend dates, which maybe the 6 week lows on May 8th, May 12th and May 18th. The last hit was on May 2nd. The next hits are May 17th then May 31. Either could be the 6-week low. The date of May 12 is the next 24 cd cycle. I brought up the August 21 Solar Eclipse in the May market letter. This should bring significant events in that time frame. In the mean time, I will monitor transits that may hit the location of the Solar Eclipse. An example in this blog is May 15th when the North Node transits over the point of the eclipse. 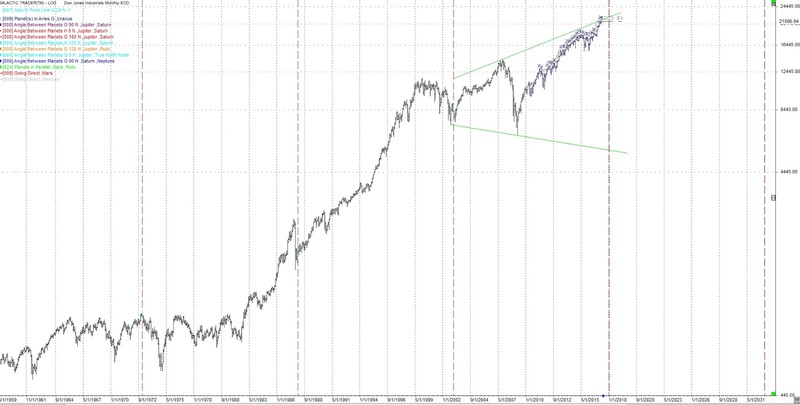 Following is a longer term chart of the DJIA (monthly). The red vertical lines are 180 months. The next one hits in January 2018 +- 4 months. 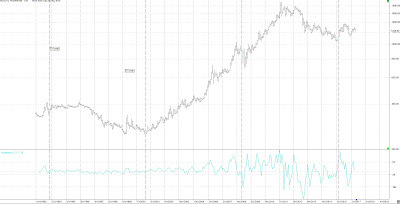 Gold most often starts a Primary cycle with a nominal 6 week sub-cycle. 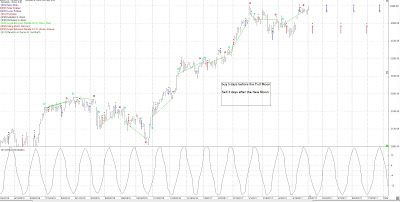 This Primary cycle appears to be in a classic 3 * 6 week pattern. Venus turning retrograde is a good signal for a move in Gold and Gold did move sharply lower at the Venus retrograde. Gold now appears to be rolling over into the last 6th week cycle which should take Gold to a Primary cycle low in May. May 11, 12 and May 19,22 all +- 2 td’s (trading days). After the Primary low is in I’m looking for precious metals to start moving up. Beyond technical’s and Astrology, countries like China are reducing the rate at which they purchase US treasuries. 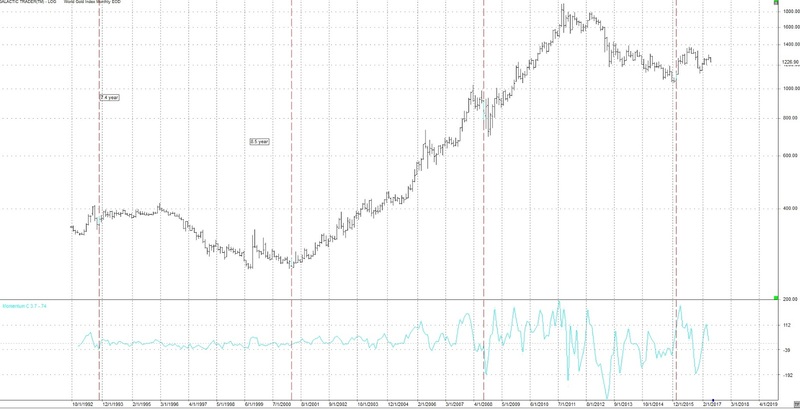 By May / June watch Gold increase. At the same the central banks of the world are expanding and the money is going into world markets. I am looking at precious metals being the trade of the year. December 15, 2016 may have been the Gold low we have been looking for. This puts us in the 21st week of the Primary cycle. 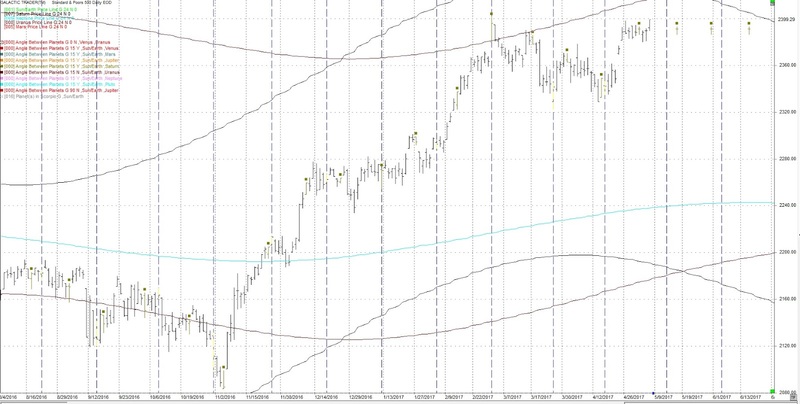 This looks like the third and last nominal 6 week cycle dropping into it’s low. Gold like many markets will be affected by the Astrological aspects from late March through April. 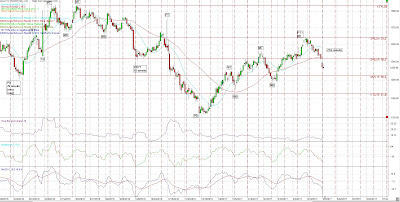 This may push Gold a little lower or add some restraint in the Spring period. Gold may be affected by the Venus and Mercury shadow dates which are May 19 and May 21 respectively. 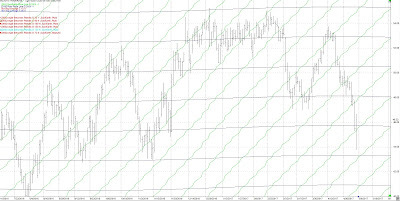 The following chart shows a 27 cd (calendar day) cycle (red vertical lines) which is next at May 15th +- 2 td’s. 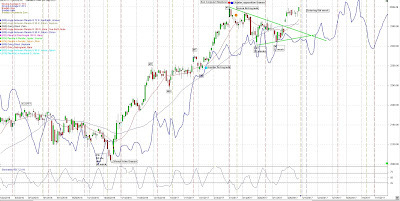 Note the MACD and CCI indicators at the bottom of the chart. CCI appears headed up. 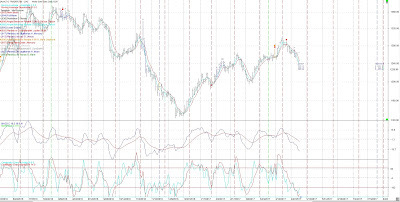 March 22nd appeared to be the Primary cycle low for crude, although not confirmed. The dramatic move down last week may result in a Primary low being formed now. This would out us in week 23 of an older Primary cycle which started November 14, 2016. If this is a new cycle which started on March 22nd and the crest was April 12th this would be a very left translated cycle and would be very bearish for crude. We will have to watch price action over the next couple of weeks. Remember we had Mars transits to both Jupiter and Neptune coming up this week. Hostilities over crude? Maybe. The blue horizontal lines are the average longitudes of the planets Jupiter, Saturn, Uranus, Neptune and Pluto converted to price. They should act as good support / resistance areas. Note how the move down stopped close to the blue line and may bounce off it. I'm watching all aspects to Jupiter or Neptune, the two rulers of crude. Crude can also be affected by Pluto as it rules “things from the ground”. Pluto turned retrograde on April 20th, in the middle of the move down. Following is a daily chart of crude showing the price lines for the Sun (green) and Pluto (black). 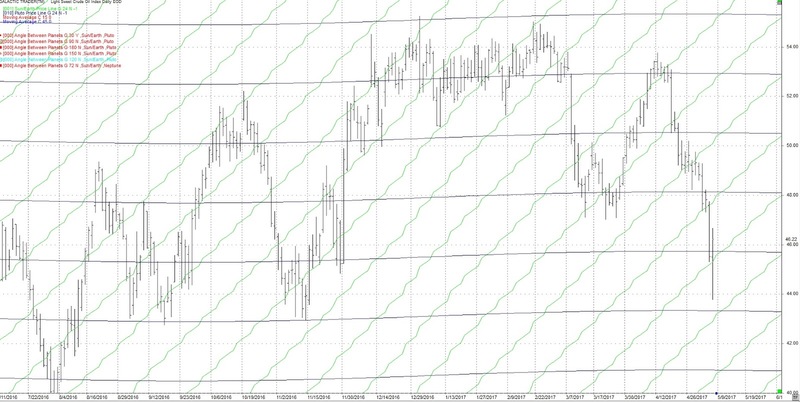 Note that recent move down stopped near the Pluto Price Line On May 4th then had a big range day on May 5th. We may see price move up the green Price Lines (Sun). also,remember that the same bears who hyped the shemitah are hyping the eclipse. they were crushed! I wasn't hyping Shemitah and no one should get crushed unless they put large money into it. I am expecting trouble near the eclipse. Read about the Saros cycle (approx. 54 years or 1/3 of it) and the Metonic cycles (19 years). If we look back 54 years we had the Cuban missile crisis the Kennedy assassination etc. I've written about these in detail in the past.